Hummingbee Bumblebird Meadow is a children’s story that was first published by Word Hut in July 2012 after being long listed in their fourth short story competition (sadly, the Word Hut website closed in 2016). Prior to that, the story was short listed in the Children’s Writers annual short story competition where it made it into the final 15% of over 2,000 entries (so into the final 300). You can see more comments about the Children’s Writers competition here. Below is the story, the feedback I received from James at Word Hut, followed by my comments based on my experiences with the competition. A fairy sat in the old oak tree. She was small, like a hummingbird. She flew like a hummingbird and when her wings flapped, they hummed like a hummingbird’s. She was called the Hummingbird Fairy. It was a lovely day, so the Hummingbird Fairy decided to fly across the meadow. Hum hum hummety hum, went her wee little wings. The Hummingbird Fairy stopped to sip some nectar from a buttercup. 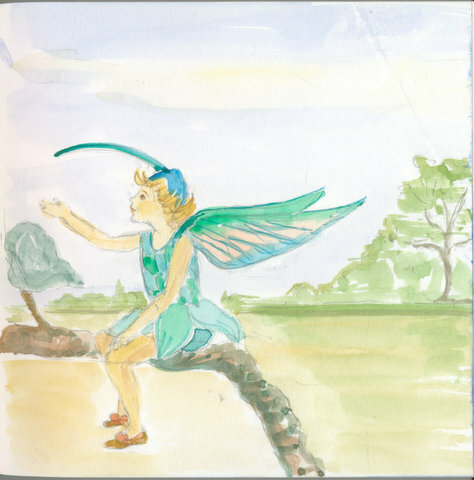 As she hummety hummed and sippety sipped, she saw another tiny fairy sitting in the hawthorn tree. The other fairy was small, like a bumblebee. She flew like a bumblebee and when her wings flapped, they buzzed like a bumblebee’s. She was called the Bumblebee Fairy. ‘What brings you to Hummingbird Meadow?’ asked the Hummingbird Fairy. The cross little fairies scowled at each other. The Hummingbird Fairy’s wings were hummety humming and the Bumblebee Fairy’s wings were buzzety buzzing. The Hummingbird Fairy’s wings stopped hummety humming and the Bumblebee Fairy’s wings stopped buzzety buzzing. They sat for a while in the hawthorn tree, enjoying the sun. ‘This can’t be my meadow and your meadow, but it could be our meadow,’ said the Hummingbird Fairy. The two little fairies sat for a while longer in the hawthorn tree, enjoying the sun and thinking of names. ‘I have an idea for a new name,’ said the Hummingbird Fairy. 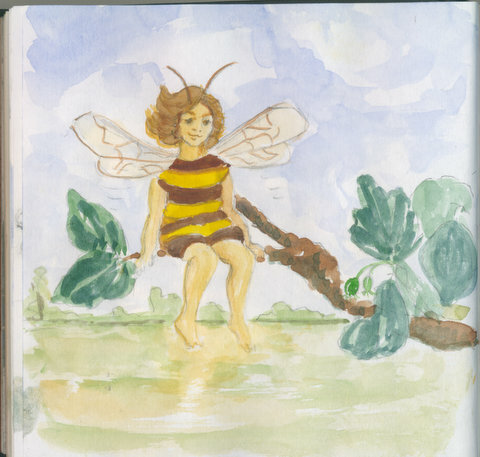 ‘So do I,’ said the Bumblebee Fairy. ‘Mine is Hummingbee Meadow,’ said the Hummingbird Fairy. ‘Mine is Bumblebird Meadow,’ said the Bumblebee Fairy. ‘I like both names,’ said the Hummingbird Fairy. 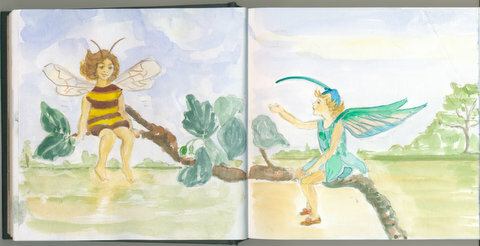 The two little fairies sat for a while longer in the hawthorn tree, enjoying the sun and thinking some more. ‘Let’s call it Hummingbee Bumblebird Meadow,’ said the Hummingbird Fairy. The two little fairies sat in the hawthorn tree, enjoying the sun and feeling very pleased with themselves. ‘Would you like to come and drink nectar with me under the old oak tree?’ asked the Hummingbird Fairy. The Hummingbird Fairy’s wings hummety hummed and the Bumblebee Fairy’s wings buzzety buzzed. The sun set, turning the sky bright pink, and the two little fairies flew away over Hummingbee Bumblebird Meadow, to drink nectar under the old oak tree. The following words appear with kind permission of James, founder of Word Hut and one of the three judges. We thoroughly enjoyed your story and found the repetition of words and phrases very effective. It’s a story both adults and children can enjoy. The story would certainly work well if read to infant children – a good moral point and repetitive language. If you had maybe ten stories like that it would be worth your while approaching children's publishers or at least contacting a local school to see if any of the teachers would trial the stories with their classes. I can imagine some great illustrations for the story too. The Word Hut is listed as a quarterly competition on my short story competition calendar, but sometimes the competitions run as frequently as every 6 weeks. Word Hut is UK based and currently has a 1,000 word limit, although it is worth checking the website regularly to view the current criteria. They offer a first prize of £50, a second prize of £25 and third prize of £10. Entries can be of any genre. Winners are published on the website. I didn’t win the competition I entered, but James still gave me some feedback and advice about the work I’d submitted via email. This is a really nice touch, as all too often in the world of publishing, all you receive is a standard rejection letter, if that. Any feedback is invaluable, so I was really impressed by how communicative the judges are. Despite not winning the competition, I was offered the opportunity to have my story published on the website. This is rare. A lot of competitions will publish winners and short listed entries, but very few will offer publication to a writer who didn’t make it that far. I jumped at the chance as it is so hard to get kid’s stories published -I just saw this as a fantastic opportunity. I should point out that publication may not be offered to every entry in the Word Hut competition, as there are always standards that must be maintained, but if you take time and effort with your writing, by entering this particular competition, you will have a greater chance of seeing your work published. In addition to the previous point, I was also offered the opportunity to be interviewed for Word Hut’s Meet the Writer section. This offers an excellent experience for the lesser known writer, and can be invaluable in preparing you for any future interviewing opportunities that might come your way. Word Hut run a variety of competitions. In the past, they’ve even run the lowest word count competition I have ever encountered. It has a 6 word limit! The frequency of the competitions run by Word Hut mean you can enter regularly and, as with other frequent competitions, you have a better chance of winning. Boring as it may be, it’s all about the maths. More chances to enter; more chances to win; less competition as frequent competitions will always have fewer entries than annual comps. It’s just the nature of the beast. However, competition is high, as you will see if you read the winning stories on the site, so always submit your best work. Word Hut is a great website and I’m sure it will grow in popularity as it develops and more writers and lovers of short stories discover it. This means the competition will become ever more competitive as time goes on. If you haven’t done so already, my advice would be to start entering now! Topher - you are a man of hidden talents. This story is lovely I must have a copy for my granddaughters Ella and Katie. Fantastic story Chris. Keep it up! Greetings Topher, just a quickie to thank you for the link to Word Hut. get one shortlisted on Word Hut. Good to see your writing is going well. 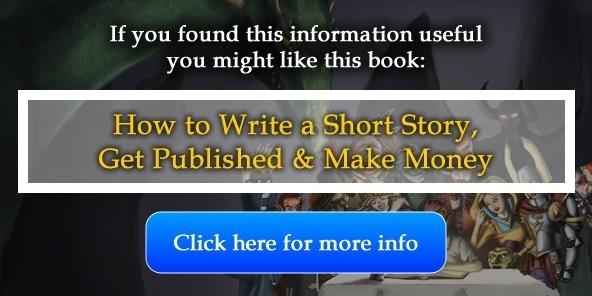 Read a few of your short stories and enjoyed. Thanking you Doc. That's really good news. Does that mean they'll publish the story for you? They put it on the website today. Better dust off some more now I guess.